Now, I know I am getting into deep water here, or maybe that should read ‘thick air’ but in talking about breath, wind, air, and so on thought must be given to atmosphere. We all know what the atmosph…Wait. Do we? Can you point at it? Can we see it? Can you measure it? Ah, yes we can apparently. The word ‘atmosphere’ is of 17th century origin and has come into English via the Latin atmosphaera which is derived from the Greek atmos (vapour) and sphaira (globe). Technically the atmosphere is the gaseous layer that envelopes a planet. The earth’s atmosphere consists of a number of sub-layers: the troposphere is nearest to the ground (and has the planetary boundary layer at its base) and has a ‘depth’ of between 7 and 17km (shallower at the poles); next is the stratosphere taking us up/down to about 50km (and contains the ozone layer from about 15 to 35km); then the mesosphere (extending to 85km); the thermosphere (which includes the ionosphere) all the way out to 690km where the exosphere takes us out to about 1,000km above the earth’s surface. Here the exosphere meets the magnetosphere. Of course, our personal compasses will already be confused by the vast scales described here before we even consider the language to describe these scales. Is it height, or depth, or thickness, is it out, above? Whilst the upper portions are evidently vital to life on this planet in terms of this research it is the troposphere which is most relevant. Troposphere derives from the Greek tropos (change or turn) and sphaira (globe). The change name-checked in the etymology is the shifting forces and pressures which lead to our everyday weather. The planetary boundary layer constitutes the first few hundred metres to 2 kilometres of the troposphere up from the earth’s surface. This is the section which concerns the day-to-day experience of most mere mortals. This is where most flight takes place (although jumbo jets and some birds fly higher up in the troposphere at around 7 to 10km above the planet’s surface) and so is the limit of our lived experience on this planet. As mentioned above these layers vary in thickness depending upon their relation to the earth’s poles and also, as can be seen in the adjacent image (and the Planetary Boundary Layer limit), the shape and depth of the layers are effected by landform, weather and so on. So far, so good. But in this introduction to atmosphere we have not even mentioned Ingold’s “weather-world” or Böhme’s take on atmosphere as “the fundamental concept of a new aesthetics.”1 Anon. 1. Tim Ingold, Being Alive (London: Routledge, 2011), 96-97 and Gernot Böhme, “Atmosphere as the Fundamental Concept of a New Aesthetics,” Thesis Eleven 36; (1993): 113-126, doi: 10.1177/072551369303600107. Links have been made between the work of Lanyon and that of Constable and Turner. Whilst (despite his skying) we can only see Constable as a son of the soil, albeit one beholden to the weather that scratches at that soil’s surface, Turner was always a disciple of light and air and one can easily imagine that he would happily have been swept up into some vortex had he had the chance. Lanyon had this chance by coincidence of his life being lived a century later. Lanyon’s pre-1950s painting are very earthy and rooted in and under the West Penwith geology, his authentic Cornish roots and knowledge of tin mining ensured he would never be a painter of only surfaces as he drilled down into the rock, epitomised best in St Just (1953). Lanyon’s landscapes are earthy and fleshy at once as human bond with land is explored in pigment. But Lanyon resists the sort of landscape painting that requires a position fixed in time and space, he cycles the lanes of West Penwith to experience movement through this Bronze Age landscape. He crawls on his stomach to the cliff’s edge and throws his imagination down into the air and spume of the zawns. From seeing gliders soaring over his landscape in the mid-1950s it would only be a matter of time before he too would be up there in the landscape (“[I] decided to go up there myself”) into what he would term the “airscape”. Birds too had offered Lanyon this way in to another way as the 1955 canvas Bird Wind hints—the colours are earth-bound but is the painter or the viewer? Are we all a hundred feet above the land turning in some invisible thermal? In the composition of his canvases Lanyon did not conform to traditional landscape diktats where the sky is at the top and land beneath. In 1951’s Trevalgan the ‘sky’ almost wraps around three sides of the land. This pushing of traditional boundaries is also witnessed in his constructions (three of which are included in the exhibition), these works are experienced in the round and hint at the direction Lanyon will take but also, perhaps, offer a nod of gratitude to Naum Gabo whose Constructions in Space with their soaring and sweeping forms must surely have left some mark on Lanyon’s creativity and artistic trajectory. By the late 1950s the land has almost been left behind, certainly any remnant of landscape tradition has been, as Lanyon soared in his glider towards an Ingoldian weather-world where the air has becomes medium rather than subject.1 At first the land still anchors like a gliders aerotow and its cable—in Rosewall (1960) Lanyon observed that “the sky which in traditional landscape occupies the top half of the picture is in this painting all around and is the element from which the land is experienced.” Lanyon learned to glide in 1959 and was flying solo by 1960 a fact celebrated in his canvas Solo Flight (1960). In his short gliding life Lanyon seemed to release himself more from the soil and celebrate as he explored that zone which is part of this world but at once not. The airscape was no longer for simply viewing the landscape from but experience in itself. Lanyon favoured a gendering of land and sea but perhaps the air freed him from this binaric thinking. The vocabulary changes and he/we now soar, glide, drift and fly through air, on thermals and currents, making “aerial encounters” with “invisible forces” where Lanyon discovers that “air is very definitely a world of activity as complex and demanding as the sea”. The coagulated air of the canvases and constructions tells of Lanyon’s exploration of the invisible air, they are smudged and blurred as previous boundaries are transgressed. However, Lanyon’s flight from the earth was no attempt at transcendence, the work stayed very much about human experience albeit one lived above the earth. The experience is somehow mediated (grounded?) by the surroundings of the glider’s cockpit and the associated terminology of gliding. There are new languages here for Lanyon and for art. Peter Lanyon died on 31st August 1964 from injuries sustained in a gliding accident two days previously. 1. Tim Ingold, Being Alive (London: Routledge, 2011), 136-139. 2. W.S. Graham, “The Thermal Stair” in New Collected Poems, ed. Matthew Francis (London: Faber and Faber, 2004), 163-166. 1. 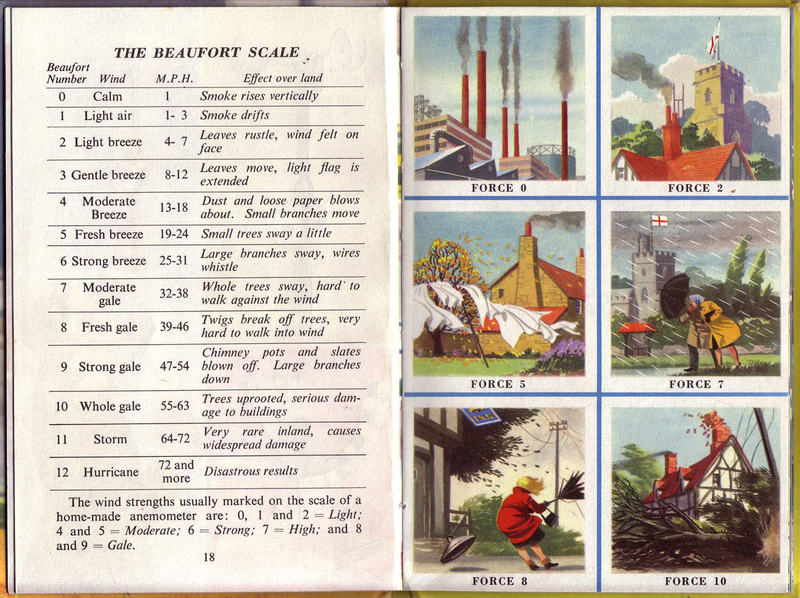 F.E.Newing and Richard Bowood, The Ladybird Book of The Weather (Loughborough: Wills & Hepworth Ltd., 1962), 40-41. Illustration by Robert Ayton. 2. Albert Einstein, Relativity: The Special and the general theory (London, The Folio Society, 2009), 171. 3. Michel Foucault, Language, Counter-Memory, Practice, trans. Donald F. Bouchard and Sherry Simon (New York: Cornell University Press, 1980), 29-52. 4. Gilles Deleuze, Difference and Repetition (London: Continuum, 2009), 36. 5. Friedrich Nietzsche, Beyond Good and Evil, trans. R.J.Hollingdale (London: Penguin, 1990), 217.